This is our monthly power rankings report for April. The amount of funds that are meeting our screens continues to contract. A closer look at one of the top ranked funds - JHI. The data for John Hancock Investors Trust (NYSE:JHI) was released to our members on April 1st. For those that are familiar with the ESPN NFL Power Rankings, which rank the teams from 1 to 32 based on the opinions of several staff members, then this analysis will be familiar to you. Here we are ranking the entire CEF universe (~580 funds) using several factors and then applying a scoring methodology to it in order to rank the funds. But where the coverage is above 99% and the shares trade at a discount. Sorted by descending overall score. The scoring takes into account all four factors that we look at: discount, earnings coverage, total yield, and one-year z-score. By combining the four factors, we are able to produce a total score. The fund is one of the oldest still in existence, with its inception dating back to January of 1971. Total managed assets are approximately $240M with a leverage of 36%. 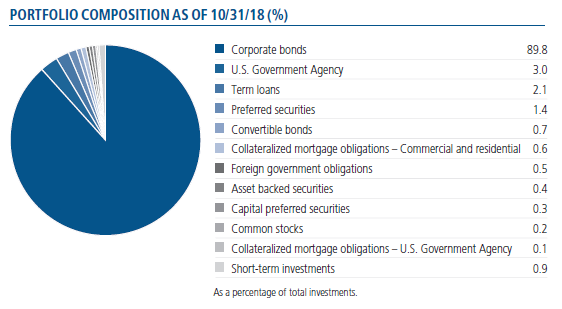 The fund holds 248 individual bond positions. The fund does not have a mandate about how much of the portfolio needs to be investment grade versus non-investment grade, but the fund today is centered on the middle portion of the spectrum. 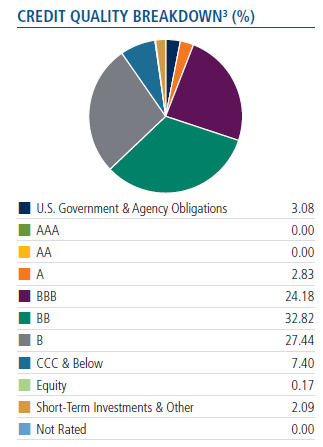 Approximately 30% of the portfolio is in investment grade including the 3.1% in U.S. government obligations. 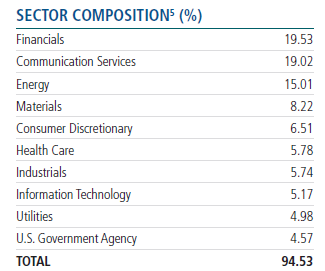 The fund's top industries are financials (19.5%), communication services (19%), and energy (15%). As you know, we are not wild on large allocations to energy and telecom given our bearishness to the sector. The fund pays quarterly, and it uses a variable pay system - meaning it ties the distribution to earnings. The chart below goes all the way back to 1989 and is a nice reflection of what interest rates did over that time period. On its website, the fund has some interesting graphs including the following upside/downside capture chart. 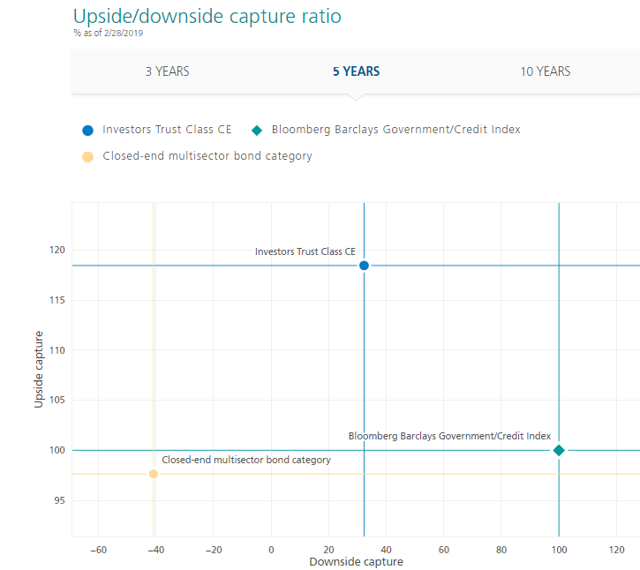 What the chart demonstrates is that the fund produces ~120% of what the Bloomberg Barclays Government/Credit Index does while capturing only about 30% of the downside. With that said, we continued to pursue a fairly defensive approach. Instead of trying to boost the portfolio's yield by establishing a large weighting in lower-quality issues, we emphasized bonds that offer attractive yields in relation to the underlying risks. Specifically, we sought securities with the potential for positive price performance stemming from favorable catalysts in the underlying businesses. The financials sector, where we identified a number of securities lower in the capital structures of investment-grade banks, was one such area of opportunity. In addition to featuring high yields relative to the risks of the underlying issuers, some bonds in this segment offer floating rates-an attractive attribute given the Fed's current policy direction. We also liked the communication and cable/media industries due to their stable, subscription-based revenues. In addition, a number of issuers in these areas may benefit from merger-and-acquisition activity. Performance has been strong, ranking third in the category for three-year and five-year total NAV return. 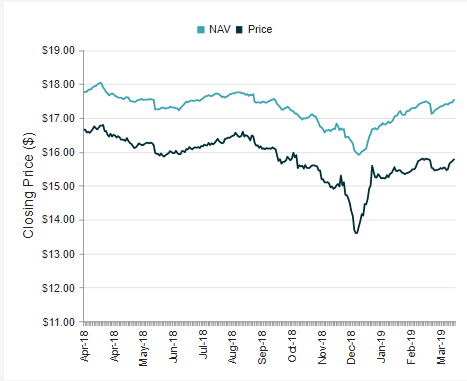 Shares trade at a 10% discount to NAV, which has historically been on the cheaper end of the valuation spectrum. The current discount is about 1.5 points off the one-year average and over 4 points below the three- and five-year averages. 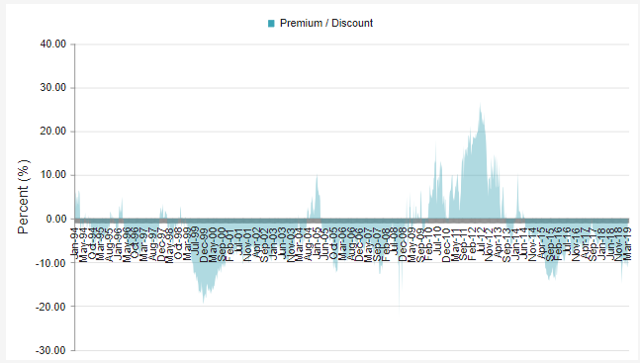 This is the "since inception" premium/discount graph. The current one-year z-score is -0.90. As you can see from the chart below, there have been several times in the last two decades where this kind of opportunity has emerged. The current discount is likely wide because of the first-quarter distribution being about 4-5 cents below average (-17%) from the prior quarters. We do think given the rising NAV allowing it to turn up some leverage, improvements in the credit markets, and the current earnings power of the fund that it will be able to increase that distribution back towards its recent average. This could cause the share price to gain about 2-3 points - at least - on the NAV, which is already seeing a nice upward slope. While the yield is a bit lower, the fund is not a riskier bet despite the leverage and non-investment-grade holdings. The portfolio managers are positioning the fund with a defensive posture but still being able to participate in the rally. In summary, there is nothing special with the fund as it has no interest rate swaps on taking duration bets, no esoteric strategies like you see in many funds. Again, this is a good time to establish a core holding in a fund that could be held for many quarters. I don't see it switching to a monthly pay system, but if it did, we could see an additional bounce in the shares of 2-3 points. Disclosure: I am/we are long JHI. I wrote this article myself, and it expresses my own opinions. I am not receiving compensation for it (other than from Seeking Alpha). I have no business relationship with any company whose stock is mentioned in this article.